Alexandrian Summer is a novel where the vibrancy of small sins and the relentless toll of everyday unhappiness surrounds and transforms the characters; where nobility fails to lift lives above venial transgressions and we hunker down in the discovery of our truer selves, the selves we all aspire to shed as we imagine the lives we had hoped to live. The story opens in the summer of 1951 with the author visiting his 10-year old self in Alexandria, Egypt. Robby stands on the balcony of his family’s second floor apartment; carefully noting the license plate numbers of passing cars and motorcycles, inventing a hierarchy of desirable numbers to enliven the game, to pass the time on a solitary afternoon. He is a slender, cerebral boy, surrounded by the chatter of his mother’s friends as they play cards in the next room, the bustle of city traffic below the balcony, and taciturn, underpaid Egyptian servants. Robby is waiting, with some trepidation, for the arrival of a second family who will share the apartment for the summer, the Hamdi-Alis: Joseph and Emilie, and their sons, David, tall, handsome and gifted, and Victor, as small, grey and insignificant as his brother is vital and infused with life. And so the reader settles in to spend the summer with Robby’s family and the Hamdi-Alis, two Jewish families who have come to embrace the pleasures of a season by the sea, and all the events, expected and unexpected, and that those few weeks hold. The novel was originally published in 1978 and translated in 2015 by Yardenne Greenspan. 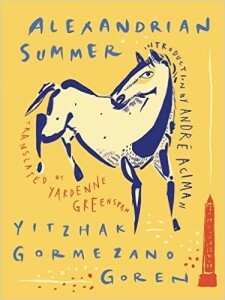 The author of Alexandrian Summer, Yitzhak Gormezano Goren, has captured that last fecund moment before the events of 1952, when Egypt’s King Farouk was ousted in a military coup, a precursor to the eventual expulsion of 85,000 Jews following the 1956 Suez Canal War. The story gives us a picture of those final few months filled with the near innocence of ordinary sins and pleasures, before disaster sweeps forward and gathers the characters into another era. Goren has chosen to illustrate this charged moment not with broad strokes and ominous foreshadowing, but by presenting a lavishly detailed account of the ordinary. The author trails behind the characters, presenting David Hamdi-Ali’s unrequited love for Robby’s indifferent sister, Joseph’s anguish over his son’s waning career as an elite jockey and Robby’s sexual experimentation with Victor and other neighborhood boys. The narrative is rich with small events, allowing the reader to relax, ignore the few reminders of impending strife and simply enjoy Goren’s characters and their everyday struggles with life. The story’s move towards a darker conclusion is almost imperceptible, and largely shrugged off by Goren’s characters. They dance in and out of summer amusements, card games, horse races, proposals and rejections, with the exception of Joseph, whose physical decline and obsession with his son’s failing career leads to the culmination of the story and his life. I’m a fan of small stories. I love the intimacy and familiarity of them, because, let’s face it: most of us fail to live epic lives worthy of a sweeping narrative. Which is not to say that Goren does not draw us forward though the story, or create tension that begs resolution and keeps the pages turning into the wee smalls of the morning. It’s just that we are insulated, well wrapped in the satisfying detail of these lives. And really, isn’t this just how it is? Our days are safely composed of minor victories and largely imaginary dramas. Goren’s characters are the same, the difference being our ability to hold those lives in our hands and the pages of the book, while knowing the imminent fate of all. The notebook was left on the railing, and the rain splattered over the numbers, the water blurred the ink, blurred the shapes, erased everything. Jody Handerson is a working writer and editor living in Boulder, Colorado with an enormous black cat, five bicycles and eighty-two pairs of shoes. She is a contributing editor to The Literary Review.